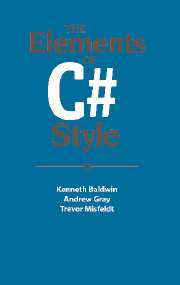 for C# 2.0 and includes discussion of advanced topics such as generics. Preface; Introduction; 1. General principles; 2. Formatting; 3. Naming; 4. Documentation; 5. Design; 6. Programming; 7. Packaging; Summary; Glossary; Bibliography.